Though Bowdoin and Colby are often considered rivals in sports, the recent opening of the new Alfond-Lunder Family Pavilion at the Colby College Museum of Art reinvigorates the two museums’ collaboration efforts—both between the institutions and with their student communities. Colby opened its new art museum to the community on July 14 and to the campus on September 12. The sleek glass building is an addition to the existing four wings of the museum. The pavilion is 26,000 square feet and makes the Colby Museum of Art the largest art museum in Maine. The new space provides galleries where students and faculty can take a closer look at objects in the collection for specific academic work. The museum also has new visual art studio spaces. “We’re excited to have the creation of art, the learning about art and the reflection on art all happening in one building,” said Sharon Corwin, director and chief curator of the museum. To celebrate its opening, the museum has seven exhibitions on display, including over 250 works of American art from the Lunder Collection donated by Peter and Paula Lunder. 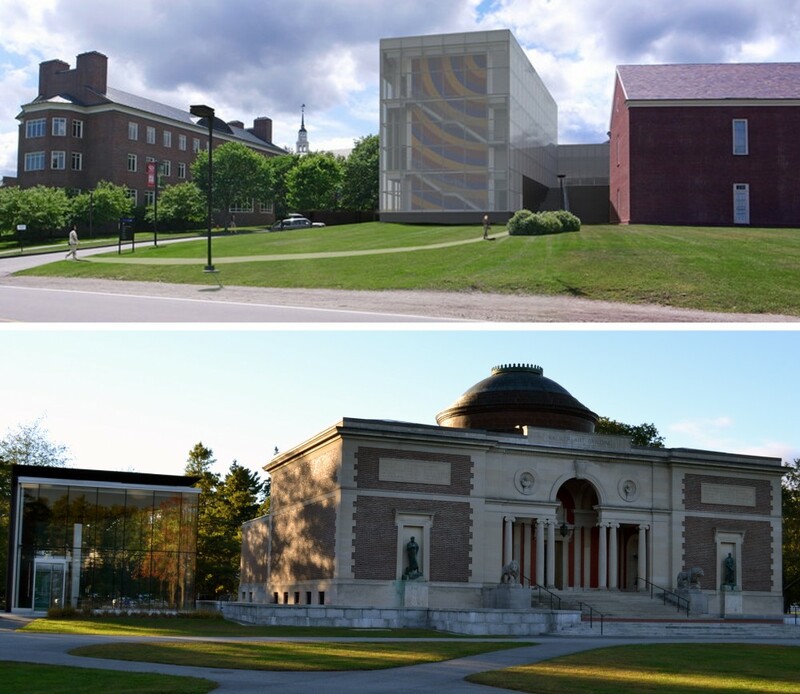 Colby’s pavilion is similar to the Bowdoin Art Museum’s renovation in 2007, which added an entry pavilion and glass wall and updated the interior. On the exterior, both museums blend modern architecture with the older styles that exist on the rest of the campuses. On the interior, they both embody similar missions to educate their students and their respective communities. While both have a well-rounded array of pieces, Colby has a large collection of American and contemporary art, while Bowdoin boasts a significant transhistoric international collection. These differences in collections facilitate collaboration between the two museums. Colby recently borrowed several pieces from Bowdoin for its Arts and Humanities theme of censorship this year. According to Anne Goodyear, co-director of the Bowdoin Museum of Art, the museums are hoping to further expand this collaboration. The Bowdoin Museum of Art is an active part in student life on campus, from hosting student nights at the museum to providing a forum for dance performances. Corwin says she would like to see the same happen with Colby’s new space. “We’re interested in being an intellectual, creative, and social hub on campus, so the students will be able to gather there for events, performances, lectures and poetry readings,” she said. Anne and Frank Goodyear, her husband and co-director of the Bowdoin Museum of Art, agree that the new Colby pavillion is a testament to the importance of art on campus. “The new building has a large glass exterior facing wall behind which is this extraordinarily colorful Sol LeWitt wall drawing. You can see it from a great distance, at night it’s all lit up, and what it says is ‘The Art Museum,’” said Frank Goodyear. Both museums also serve as academic resources for their visual and art history departments, as well as many interdiscinplinary areas. “We see over 80 courses a year come in with their professors to study objects in the collections or exhibitions on view for courses ranging from physics to the classics to American studies,” said Corwin. Both Colby and Bowdoin offer students opportunities to help behind the scenes at the museums through docent programs and internships. “The sky’s the limit in terms of looking at what might be possible and ensuring that Bowdoin is an active participant in the larger intellectual community,” said Anne Goodyear. When Robi Hutchinson left his job as a producer in Hollywood and moved home to Brunswick two years ago, he knew he had to find a good breakfast haunt. "I got on the Internet and the only place that had any kind of ratings was Jen’s Place," he said. "This was the spot." Jen’s Place is tucked inside a low one-level corrugated metal building on Brunswick’s Stanwood Street. It is neighbored by the Northern Chi Martial Arts Center, sidelined by the railroad tracks, and across the street from a fleet of lawnmowers parked on the grass outside of the Brunswick Home and Garden Shop. The restaurant serves breakfast seven days a week and opened its doors four years ago this month. It is frequented by Bowdoin students, but tucked just far enough from campus that most of them come via car or bike. I arrived in Cairo on Wednesday, June 19, eleven days before the onset of nationwide protests that were to depose President Mohammad Morsi and the Muslim Brotherhood. I moved into an apartment on 15 Bostan Street, a couple minutes walk from Tahrir Square. In true foreigner fashion, I found myself paying double-price for the taxi, dragging my suitcases into the lobby. Most apartment buildings in Cairo have a doorman—a bawab—and I spent our first conversation trying to explain that I was claustrophobic and was going to walk up eight flights of stairs to my apartment. He smiled and grabbed my suitcases as he stepped into the elevator. I started climbing. The summer before, I had studied at Middlebury’s Arabic program with a friend who then recommended a language institute in Cairo. I took his advice, and this summer, I signed up for six weeks of an intensive language course and gave myself a week at the end to travel around the country. In Egypt, like in every other Arabic-speaking country, people speak a local dialect of Arabic known as aamiyya. Aamiyya and fusha are like two languages that, while obviously related, are still noticeably different. I, like every other foreign language student, learned the latter—it is taught in schools, spoken in official capacities and used for all written Arabic. However, I soon learned that no one spoke it outside of a presidential address—ever. As I explored the streets near my apartment, I tried to pick up conversations with whoever was willing. Midway through one, the man I was speaking to paused, saying, “I can’t believe I’m speaking fusha right now”—obviously saying most of it in aamiyya. I was a Shakespearean character walking around twenty-first century London; all I was missing was the medieval outfit. Between the 2001-02 and 2011-12 academic years, the College increased its funding for need-based financial aid grants from roughly $10.4 million to approximately $27.2 million. Financial aid and grade point average (GPA) have no correlation, according to a nonscientific survey conducted by the Orient, to which 395 students responded. The survey asked students about their academic success as it related to their financial and work situations. Forty-six percent of the survey’s respondents say they receive financial aid, which is close to the actual percentage of students receiving grants from the College. In the 2001-02 academic year, 39 percent of students received grants from the College. That number rose to 46 percent by the 2011-12 academic year, according to the College’s Common Data Set. In recent years, the percentage of students receiving aid has increased on a class-by-class basis, according to the online Class of 2016 profile. Upon matriculation, 41 percent of the entering Class of 2013 received financial aid; this year, 48 percent of the Class of 2016 received financial aid. The average grant for all students has increased by $1,100 since the Class of 2013 matriculated, from $34,350 to $35,450. The average grant for students in the Class of 2016 is $38,740. Director of Student Aid Michael Bartini said that he thinks the reasons for these increases in financial aid are two-fold. Because the cost of education has risen, “more and more families with higher incomes are qualifying for financial aid,” according to Bartini. The College’s financial aid policies have also changed over the past decade. In 2008, Bowdoin eliminated loans from its financial aid packages. In May 2012, the Orient conducted a survey of graduating seniors. The results showed that, of the 30 percent who would graduate with debt, the average amount was $25,895. According to the U.S. News and World Report, 16 percent of Bowdoin students receive Pell Grants, which are awarded by the federal government based upon financial need. This year, students who qualify for Pell Grants can receive up to $5,500, depending on their financial circumstances and the cost of their college. Thirteen percent of the Class of 2016 received a Pell Grant this year. That isn’t always easy. Faustino Ajanel ’16, a first-generation college student from Los Angeles, said that even applying for aid was an obstacle. Ajanel had problems filling out his CSS Profile—a form that allows students to apply for aid—during his senior year of high school. For many of the students interviewed for this report, financial aid packages were significant factors in choosing to come to Bowdoin but were not always the deciding factor. “I made my decision to come here despite financial aid packages, rather than because of” them, said a sophomore female who wished to remain anonymous due to the sensitivity of the issue. Many students receiving financial aid work to earn spending money or to help cover costs. Students are allowed to work a maximum of 20 hours a week in on-campus jobs. Some, albeit few, students work additional hours off campus. One sophomore female’s parents made her quit an additional off-campus job “because I wasn’t sleeping. The pressure [to work] comes from myself and it definitely impacts my academics,” she said. “When you’re at work, you’re not sleeping or doing homework or socializing, which are the three things you should be doing at school. Students who work fewer hours on campus face less of a challenge balancing making money and academics. “It definitely takes time to work—eight hours a week is not a pittance—but it’s time that I don’t feel like I need in order to keep up with studies,” said one senior male. Financial aid can also serve to motivate the students who receive it, according to Anna Chase ’13. “I work really hard for personal fulfillment, but in the back of my mind sometimes I want to do really well because I’m getting so much help to be here—sort of to prove that I deserve the help, deserve the aid, and that I can be the best student I can be,” she said. If commitments become too much, the College provides several resources for students struggling academically or looking to improve study skills, regardless of their background or GPA. One of these resources is the Center for Teaching and Learning (CTL), which includes the Writing Project, the Quantitative Reasoning Program, and the Baldwin Program for Academic Development. Director of the Baldwin Program Elizabeth Barnhart said that students have all sorts of reasons for seeking her help, but added that a lack of preparedness is perhaps the most common. She said that the diversity of secondary schools from which Bowdoin draws helps explain the varying degrees of preparedness within the student body. Ajanel said his public Los Angeles high school’s curriculum was not designed to get him ready for a school like Bowdoin. If students are not succeeding academically, Barnhart said, the College does a good job of encouraging them to seek out the Baldwin Program. “Counseling, Dean’s Office, faculty, advisors—it’s kind of that network of referral,” she said. Ajanel said he would not have gone to the CTL during his first semester if not for this network. “People had to push me to go there. I didn’t want to ask for help,” he said. Despite the success of the network of administrators and faculty, the College has sought new ways to help students from diverse backgrounds reach their full academic potential. The group recommended several programs to help students adjust to academics at the College, including an intensive advising program and a lower-level math class. The College has since launched the BASE advising program and begun offering Math 050: Quantitative Reasoning. The BASE advising program pairs first-year students with specially-trained advisors. Faculty Liason for Advising Suzanne Lovett, one of the people behind the program, distributed a report on the success of the program at the February 6, 2012 faculty meeting, according to the minutes. The report indicated that students in BASE were far more likely to solicit and receive help from their advisors than students not in the program. Lovett could not be reached for comment by press time. Some students who receive aid said that adding social and extracurricular activities into the balancing act of work and academics is complicated, though most have found few differences between themselves and their wealthier peers. “I know people who are paying for everything on their own; they’re a lot more stressed out than I am. I have friends who are here on no financial aid, whose parents donate, and then I have friends who are like me,” said one sophomore female. Ajanel said he thinks Bowdoin students do not discuss wealth or privilege frequently enough, and that most students make little effort to understand his background. For all the students interviewed, navigating financial situations is trickier when it comes to off-campus activities. “I’ve never been out to eat [in Brunswick] except when my friends’ parents take me out,” said the sophomore male. “There are times when I really wish I could go to New York for a weekend,” one sophomore girl said. “When people are comparing their summer plans, that’s when I feel it most.”On campus, though, money is less of an object. “I definitely think Bowdoin makes a lot of effort to make things equally accessible to everyone. You don’t pay to go to most of the events, it’s a package deal. There’s a ton of stuff you can do without spending any other money,” said a sophomore female. “Everything’s pretty equal opportunity,” he said. “Bowdoin does a really good job—you don’t have to spend any money really,” said another sophomore female. One sophomore male who receives $40,000 in aid found that getting rid of his meal plan significantly reduced his expenses. “I can never go to the dining hall with people,” he said, but he tries to make up for it by having friends over for dinner. “Other than not going to the dining hall, everything’s pretty much the same,” despite his financial situation. I write in response to the editors’ request for my opinion of the NAS report with regard to the government department and to the report in general. First, although the NAS study purports to be an “ethnography” of Bowdoin over the past 40-plus years, it fails to provide a comprehensive answer to the question “What Does Bowdoin Teach?” As others have noted, the report makes much of the fact that history does not require (or even offer) a course on the American founding, but that does not mean that Bowdoin students are denied the opportunity to study this subject. As the report finally gets around to acknowledging (footnote 1155), the government department offers a survey of American political thought that treats the founding in depth (the NAS likes survey courses! ), and has done so for the last 25 years. Second, the report calls attention to many of the narrow and/or ideologically charged first year seminars on offer, but it passes over more traditional seminars without comment. The government department regularly offers a number of such classes, including “Human Being and Citizen” and “Fundamental Questions: Exercises in Political Theory,” both of which introduce students to the great books of political philosophy. What’s more, every major must take at least one course in political theory to complete the requirements for the major, ensuring that Bowdoin graduates in government (the largest major on campus) will have some familiarity with classic texts. On a related note, at least five government courses assign The Federalist Papers. Although the report generally exempts the government (and economics) departments from criticism, it seems less interested, even by its own lights, in what Bowdoin does well. March 28, 2014 5:12 p.m.: An earlier version of this article incorrectly stated that the average GPA of all students in 2005 was 3.25. The correct statistic is 3.23. President Barry Mills delivered a report on athletics at a faculty meeting on February 4, providing a rare look at the College’s efforts to recruit athletes and opening a discussion about their collective performance in the classroom. The collective GPA of female athletes is slightly higher than that of the general female population, while male athletes are just a shade below the male average. According to a Bowdoin Academic Affairs web page, at the end of the fall 2005 semester the cumulative GPA of student athletes, including members of club teams, was 3.22, almost indentical to the all-student cumulative GPA of 3.23. The College has not updated these statistics since 2005. “It’s absolutely a point of pride within our campus community and the athletic department,” said Tim Ryan, althetic director, about the negligible GPA difference between athletes and the student body at large. “It’s a testament to the work our coaches do to bring highly talented students to campus who are dedicated to their academic interests. Multiple professors on campus pointed out that they were not concerned with athletes in general, but rather a select few who seemed to be underperforming academically. Each admissions cycle, Bowdoin is limited, like all other NESCAC schools, to 77 athletic recruits—students who gain admission aided by the fact they play sports. Bowdoin has a self-imposed, flexible cap of admitting around 120 student athletes in each first-year class. This means a total of 43 athletes are admitted solely on the basis of their academic achievements. No other NESCAC school has a similar limitation. President Mills instituted the cap of 120 when he came to Bowdoin in 2001. “I believed that we could have competitive and excellent teams, and at the same time, given our small size, it would leave enough space to admit people with other interests,” he said. Ryan echoed Mills’ interest in bringing a diverse student body to Bowdoin each year. After Mills’ February faculty meeting remarks, faculty members launched into a larger discussion about the relationship between college athletics and academics. “One of the issues that came up was students missing classes on Fridays due to away games,” said Boyd. The administration “talked about how that had all been worked out and there wasn’t supposed to be any missing of classes. But then some faculty members said ‘Actually, no,’” there had been incidents of it. While unanimously agreeing that there is value in participating in athletics, some professors said they felt that athletes at Bowdoin are pressured to dedicate an inordinate amount of time to their sports. “There are some very bright people who don’t have the time or energy to reach their potential in the classroom,” said Kohorn. “If teammates are saying ‘Oh, don’t take that class because of practice,’ then that’s really detrimental to the academic program of the institution,” said Boyd. Student-athletes, too, acknowledged the strain that practices, games and other team functions can put on their studies. Duplissie-Cyr opted not to play a varsity sport at Bowdoin because of the additional time commitment. “I’ve heard [varsity athletes] complain about getting back from a game at 11 o’clock on a Tuesday night,” he said. Despite this, many athletes reported athletics having a positive effect on their academics. According to Mullaney, being a member of a sports team has improved her academic experience as a first year in multiple ways. Because field hockey is a fall sport, she said she developed her study habits during her busiest time of the year. “It would be much harder starting with lots of free time and then going into a sport,” she said. However, several athletes confirmed the concern that Boyd had—that student athletes often choose classes around their sports commitments, as a way to more prudently manage their future schedules. According to Professor of Economics Jonathan Goldstein, athletes at Bowdoin have little incentive to dedicate time to schoolwork at the expense of their athletic careers. However, not all professors on campus said they agree that student-athletes should always have to be students first. Even though the College’s student athletes have limited time to spare for schoolwork, academics are a major concern for the Athletic Department. Whether they like it or not, coaches at Bowdoin must look to recruit players who will meet the approval of the Office of Admissions. “Regardless of how good a player someone is, the school’s not going to accept them if they don’t think they’re qualified,” said Tim Gilbride, the head coach of men’s basketball. As for non-recruits, the definition of “qualified” at Bowdoin is fluid when compared to other peer institutions. Once given a clear picture of what to look for in recruits’ academic profiles, coaches work hard to project which of their target players stand a good chance of admittance. As a result of the non-formulaic approach in admissions, Bowdoin coaches must pay particular attention to their athletes’ non-athletic performance. Dean of Admissions and Financial Aid, Scott Mieklejohn, declined to comment for this story. “We save all the information of kids we’ve admitted in the past and say to ourselves ‘How did Admissions read this kid?’ So we’ll do some pretty lengthy analysis for future reference,” said Caputi. Like all Bowdoin students, athletes have the opportunity to utilize many academic resources. Coaches make sure to let their players know what is available on campus. Coaches are also concerned about keeping close tabs on their players’ grades. “All freshmen and anyone who got below a 3.0 in the previous semester go to a study hall once a week for an hour,” Cardew said of the lacrosse team. Most recruits succeed in the classroom once at Bowdoin, and many excel. Eighty-four Polar Bears were named to the NESCAC All-Academic Team this past fall, and 77 were named for the winter season.